I cannot believe we are on the final countdown to Halloween now; it's only less than a week to go until the most spooktacular event of the year arrives. To celebrate, I am posting a review very fitting to the occasion. 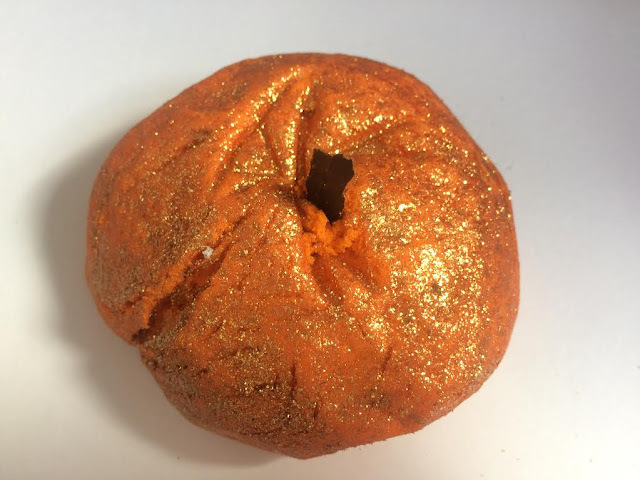 You may remember earlier on in the month I wrote a post all about what I had purchased from this year’s Lush Halloween collection (if you haven't seen it- click here!). 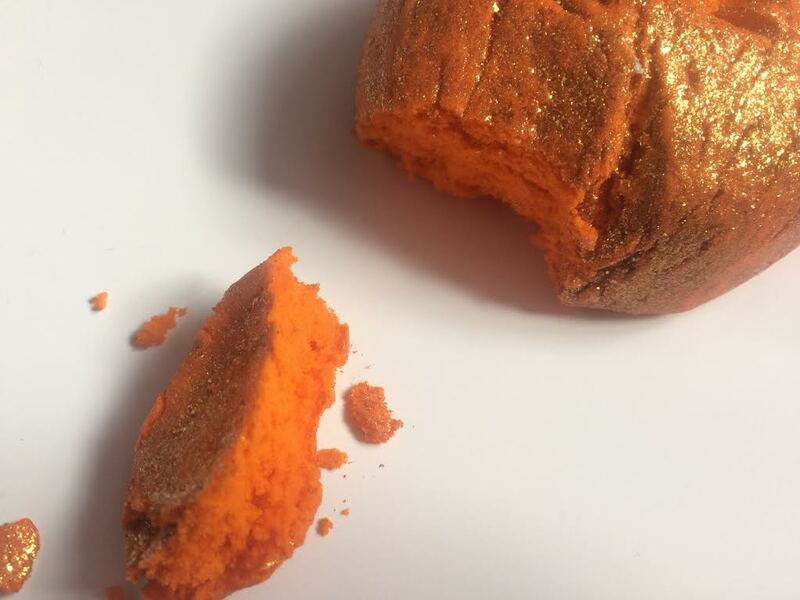 In this post I'm going to be reviewing one of the products I purchased which is the Sparkly Pumpkin Bubble Bar. This is a product which I think some people may be deterred by due to the vast amount of glitter which covers this cute little pumpkin. If like me, the glitter doesn't bother you you'll love this, if you absolutely cannot stand glitter then this product probably isn't for you. That aside, this is probably one of the most adorable looking bubble bars that Lush have released in recent years and there's been lots of them. Sparkly Pumpkin has such a lovely smell, it's very sweet and fragranced which is something I love. It contains lots of essential oils such as Juniperberry (good for hair), Lime, and Grapefruit which makes for such an indulgent bath making you feel good for it afterwards. 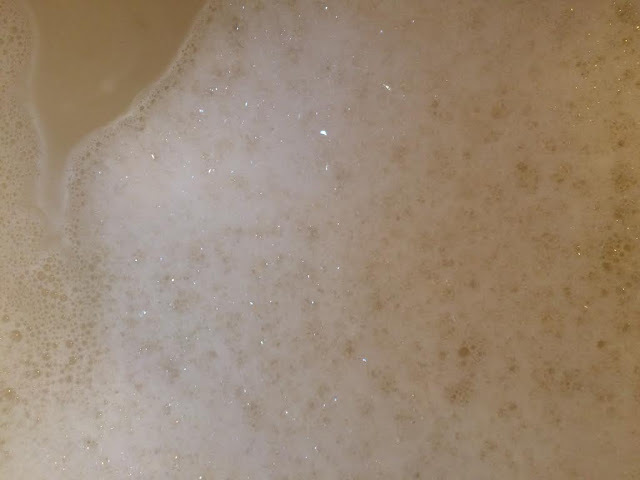 I crumbled a small little piece from the bar to put in my bath and it left me with an adequate amount of bubbles, you can put a bigger or smaller piece in dependent on how many bubbles you want. Underneath the bubbles, I found that the water slightly changed colour to a light orange colour. Like a lot of Lush bubble bars and bath bombs, I found that this product made my skin feel soft afterwards which is such a lovely feeling especially if you have been in bath water for some time and it dehydrates your skin. The only downside like I say if you don't like glitter is that you may have some glitter residue on your skin after you get out of the bath. I personally had some on my hands after, which doesn't bother me at all but it is a point worth noting if you are considering purchasing this product. I absolutely love this bubble bar however, and luckily I think I should have enough for a few more baths. It will only set you back a mere £3.95 for each sparkly pumpkin which you will be able to get a few baths out of so it is well worth the price! Let me know if you've tried this bubble bar or any of the other products from the Lush Halloween range! Love that you've managed to get more than one bath out of this!